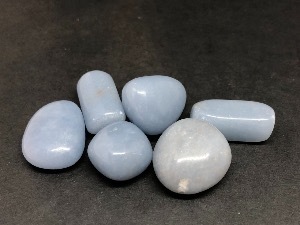 Angelite crystallises in the form of blue and white masses, nodules, and crystals; it occasionally, contains a splash of red hematite. It was discovered in Peru, South America, during the time of the harmonic convergence and is a symbol of the verbalisation and communication of love and light to the world. Said to be an excellent balancing agent, polarising and aligning the physical body with the ethereal network. It is said to dispel anger, renew ones connected-ness with universal knowledge, and initiates a parting-of-the-impediment during innovative pursuits. Angelite (Peru) tumbled to a smooth finish, an ideal pocket size stone, small enough to carry around with you. Tumble Stones can also be placed around the home for their energies or can just be nice decorative items. 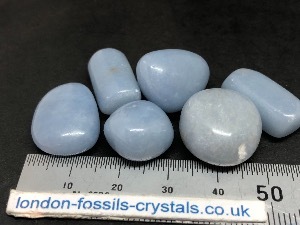 Angelite (Peru) crystal gemstones of varying sizes and quality selected specially for your order.